If opening your snap off watch case was easy but you couldn’t close it with just the strength of your hands, you might want to try using a watch case press to close the watch case. 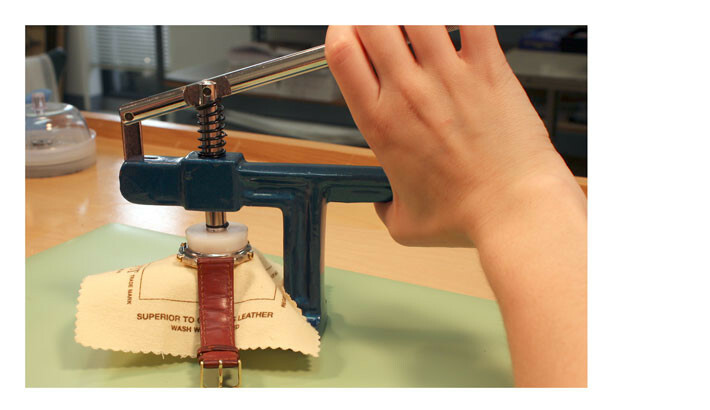 Bear in mind that watch case presses can exert a lot of pressure, and can potentially damage a watch case or crystal – if you do not feel comfortable operating this machine, take your watch to a jeweler or watchmaker. When you have finished your repair and you are sure everything is in working order, place your watch case back on the case, aligning the notch in the back with the watch stem. Make sure that notch is perfectly aligned above the watch stem before placing the back on the watch case, otherwise you will risk damaging the watch movement. Now you need to make sure you have the right sized dies to hold the watch case in the watch press without crushing the crystal or other watch parts. The dies should fit each side of the watch case perfectly. The die on the case back should sit on the outer part of the watch case back and the die on the crystal face should sit outside of the watch crystal bezel without putting pressure on the crystal, the case tube, or the watch lugs. 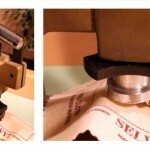 Fit the dies to the case press. The die that will fit the watch crystal should be placed on the bottom part of the jaws and the die for the watch back should be placed on the top part of the jaws. 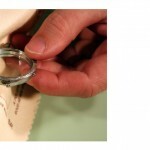 Use a Selvyt Jewelry Cloth to protect the watch crystal from getting scratched. Place it between the bottom die and the watch crystal before putting the watch case facedown between the dies. 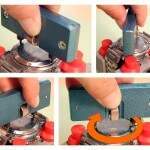 Grip the watch press handle and slowly press down to apply pressure, to close the watch back. 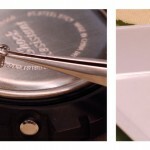 Be careful not to apply too much pressure as it could damage the watch case or crystal. 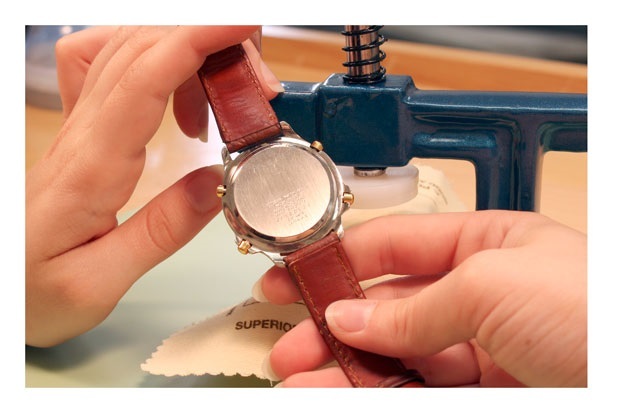 When you hear the back snap into place, release the lever and remove the pressure from the watch case. 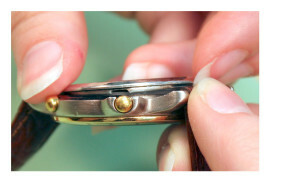 Take the watch case from the dies and examine it to ensure that the case back is closed and the watch is undamaged, now you are ready to reset your watch and wear it.